I made this Japanese "matzah ball" soup for our Seder meal. It's a soup that can be enjoyed any time of the year you're craving some good old chicken soup, though. This recipe is an adaptation of one I saw on Tori Avey's website by La Fuji Mama. 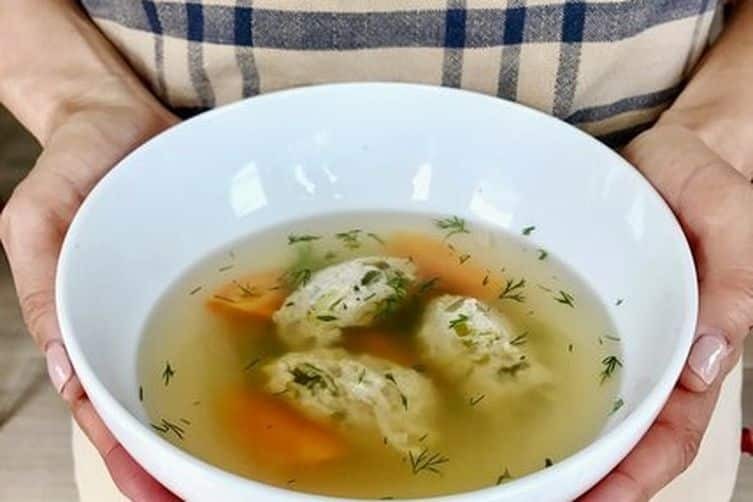 My version incorporates similar chicken tsukune meatballs, while the soup is my classic chicken stock to make it taste closer to a matzah ball soup. Make the tsukune: Combine all ingredients except the vegetable oil into a large mixing bowl and mix with your hands to combine. Rub a dime-size amount of vegetable oil onto the palms of your hands, and start making meatballs that are 1½ inches in diameter, slightly smaller than a golf ball. Place them on a baking sheet. If the meat starts sticking to your hands, add more oil to your hands. You should get about 18 balls. Make the soup: In a large pot, bring the chicken broth to a boil. Reduce to low and add the carrots. Cover the pot and simmer for 10 minutes. Using a slotted spoon, remove the carrots and set aside. They should be firm and hold their shape but not be crunchy. Increase heat to medium and add the meatballs into the pot, one by one. Cook for 10 minutes. Check one of the meatballs for doneness by cutting it half. Turn the heat back to low. With a spoon, skim the surface of the soup of any white bits that have floated to the surface and discard. Return carrots to the soup. To serve, sprinkle a bit of dill into empty bowls and pour the hot soup and two meatballs over it. Sprinkle some freshly ground black pepper into each bowl and serve immediately.